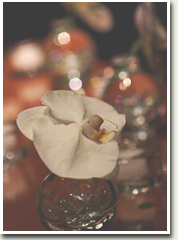 Planning a wedding should be a memorable experience filled with excitement and sweet anticipation. Love Notes can make your dreams into reality. Why hire a wedding coordinator in the first place? Though wedding coordinators were once a luxury for a select few, they have now become an affordable necessity for all couples. Wedding coordinators offer a variety of planning services. From coordinating every possible aspect of the wedding to serving solely as a coordinator for the rehearsal and wedding day events, Love Notes can assist you in planning your perfect wedding! A wedding coordinator can handle time-consuming and stress-inducing details involved with planning a wedding, regardless of its magnitude. Most couples will agree that enlisting the services of a wedding coordinator helps make the wedding planning process much more enjoyable. Love Notes is committed to bringing the same creativity and attention to detail to all its clients' events, regardless of budget. © 2003-2016 Love Notes Events, Inc. All Rights Reserved.